Who are Home Instead Senior Care? We are an award-winning home care provider and part of a worldwide organisation devoted to providing the highest-quality relationship-led care for older people in their own homes. We have been at the forefront of specialised home care supporting those being cared for and their families for many years. 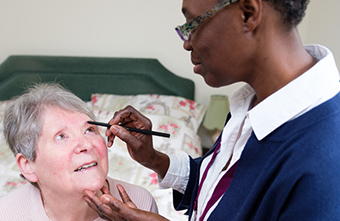 Our mission is to be the UK’s most admired care company through changing the face of ageing. What we do is personal. It’s tailored, it’s flexible and it’s adaptable as needs and preferences change. Most importantly, it means we help people to foresee a life at home living happily, comfortably and independently. We believe care should be about having a choice and planning ahead, not about reacting to a situation or development. Sadly, all too often, accidents in the home and sudden illness are often the reason that kick starts the ‘care conversation’, often resulting in a rushed and unsuitable care decision. 71% of people would rather grow old in their own homes, but due to our society’s often ‘reactive’ approach to care, it doesn’t always work out that way. Addressing care, providing support, before it’s needed is the best way to avoid this. We’re here to help you do that. When it comes to care, there’s no one-size-fits-all approach, so we don’t offer one. People are different, so we are different. It’s as simple as that. Every tiny detail of every service we offer is tailored to the needs of the person needing care, but also their close family. Our care at home services are wide ranging. Some people simply need help outside of the home, such as when they go shopping. Others may need help with personal care including: bathing, dressing, and enjoying nutritious meals. Our care and support also takes into account life changing or long term illnesses such as dementia, Parkinson’s and many others. Finally, many people we support simply want company and conversation due to loneliness, recent bereavement or for a new friend. Why is home care good for my family? Time spent with your loved ones in their old age should be fun, not challenging. We spend our time taking care of the essentials, so you can spend time doing the things you enjoy most. Choosing a high quality, trusted home care provider removes a great deal of the stress surrounding long term decision making for your loved ones and time after time, home care is the least expensive arrangement compared to care delivered in a residential setting. Why is home care good for me? It’s flexible, it’s hassle-free and it’s enjoyable.. You’ll get to stay in your community and live under your own roof, surrounded by your own things and continue to live by your own rules. One of the best things about what we do is that it doesn’t ‘feel like care’. Or at least, it doesn’t feel like what many people think care feels like. Our CAREGivers don’t wear uniforms as we believe this only accentuates the receiving of care. Although our CAREGivers are professional and highly trained, they carry out their duties appearing just like a friend or companion. If you are happy living at home, but may need some extra help with certain things, and don’t have any specific medical requirements which require nursing, then home care might be right for you! Is home care right for you and your family? If you are considering care for yourself, do you: wish to remain living happily at home continuing to make happy memories in familiar surroundings, live largely unsupported but need some extra support around some key activities of daily living, or need help with doing certain things in the home to live safely and independently? Then home care might be right for you! If you are thinking about care for your family member, are you: struggling to provide support yourself due to time, work, a lack of proximity to your loved one, or other pressures, looking for the time spent with you to be sociable and fun, enjoying the close bonds that come with family and friendships, concerned about the long term costs associated with residential care? Then home care might be the right option for your family. How can you ensure that I receive a CAREGiver that I like? Our award-winning care comes down to our team of trained and experienced CAREGivers. We take time to select empathetic, enthusiastic people with a big hearts and warm, friendly natures, who want to build positive caring relationships with their clients. We make sure that we choose people who have a range of interests whether it is following a football team, enjoying gentle walks, or painting, crochet and craft making. Whatever it is that floats your boat and, we’ll find the right person to support you to become your chosen companion. Our CAREGivers are here to assist you in 4 main areas: home help, personal care, companionship and dementia care. Click to see a full list of our home care services. Isn’t home care more expensive than residential care homes? You don’t need us to tell you that some care options are often perceived as expensive. But that doesn’t mean all of them are. Home care can be a service you pay for at your choosing. You decide the level of care and support you need, as long as you want it – you only pay for the one to one care you receive rather than paying a care home provider to fund care which is shared across many individuals. When looking at it that way, home care makes for a smarter investment than residential care. Compare care home costs with home care here. I/my loved one have/has dementia. Can you care for me? At Home Instead we recognise the challenge of caring for someone living with dementia and our years of experience in helping families to cope with the situation at home means that we are able to offer expertise when it comes to providing care and support for someone living with dementia. We have also developed a City & Guilds accredited dementia training programme so that our CAREGivers are properly trained to care for those living with dementia. How is your approach to dementia care unique? We have developed a unique training programme for CAREGivers which is accredited by City & Guilds and is specialised for the home care environment. It has been developed by experts in ageing, dementia specialists and by key medical practitioners from across the world. It means you can rest assured that you will have the right team in place to put your mind at ease and know that your loved ones are receiving the best care available. Home Instead Senior Care provides non-medical care which means anything that doesn’t involve nursing intervention, such as administering injections, changing wound dressings, and taking vital sign measurements. Residential care involves someone leaving their home and belongings to relocate into a facility dedicated to round the clock care. Residential arrangements can vary from being able to come and go as you please to more custodial, where residents are protected from any potential safeguarding event. Social care consists of services which support people with needs arising from illness, disability, old age or poverty. Social care can include domiciliary care, day centre provision, provision of equipment and housing options with varying levels of care. Social care is under pressure from a lack of funding and is not free at the point of use as is the case with NHS healthcare. Why do you use the term CAREGiver/who are CAREGivers? We use the term CAREGivers because we do not necessarily recruit carers who previously have had a social care or health care background. We look for kind, caring, empathetic individuals with a loving heart who want to dedicate their time to helping care for older people. 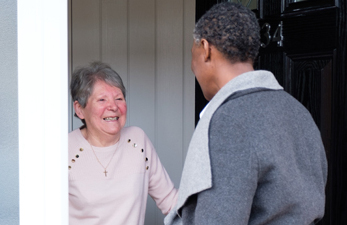 We train them to have the skills and confidence to care for older people in their own home which includes how to provide care with dignity and respect. Dementia is a progressive illness and is caused when the brain is damaged by diseases such as Alzheimer’s disease or strokes. There are different types of dementia but in the main, dementia is caused by a disorder of the brain caused by disease or injury and is marked by memory problems, personality changes and impaired reasoning. Diagnosis usually takes time but the earlier this happens the more chance there is of receiving help and support.